I was real excited to get my hands on the Blink Home Security Camera System. These cameras are made by a startup company that was funded by a Kickstarter campaign. They have a lot of lofty product plans as they try to fit the product space that’s halfway between a home security camera and an affordable home security system. For those unfamiliar the differences between a home security camera and home security system, the latter is going to be able to accomplish some additional monitoring beyond motion or sound. A home security system camera integrates environmental monitoring such as temperature as well as advanced alerts. Competitors to Blink, at least in my opinion are Canary and Piper. 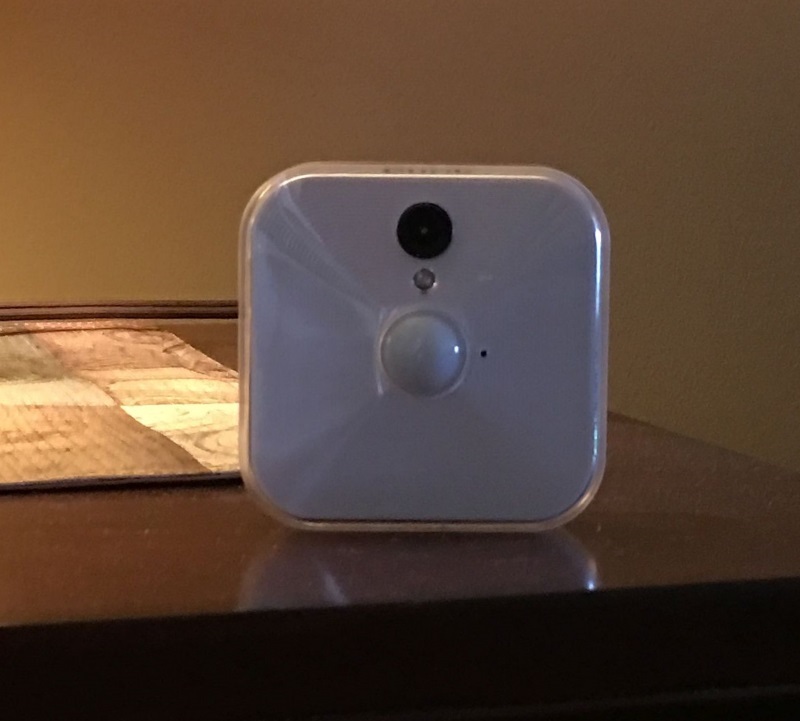 I’m a big fan of the Canary and that’s why I was excited to try the Blink Home Security Camera System. You can access the Blink Home Security Camera System with your iOS or Android smartphone. Blink plans to support these cameras with a web app but that’s a future plan. The instructions out of the box are sparse. It basically tells you to download the app and use it to connect the sync module then follow the app directions. You will need the serial number to connect. The serial number is found on the side of the box, the bottom of the sync module or inside each camera’s battery compartment. The app starts up quickly on my Apple iPhone 6s Plus. Starting the video isn’t as quick. I would estimate a 5 second average delay to start. Once you’re into the video, the playback was smooth and uninterrupted. Motion event alerts are supported. Like many other home security cameras, the sensitivity of the alert can be adjusted from low to high. Blink is designed to capture motion based on heat moving across the field of view of the camera and moving the sensitivity downwards can avoid the alerts coming your way. Unlike many of the higher end home security cameras, there are no options for establishing motion zones to eliminate areas that are prone to activity that causes false motion alarms. You can set the delay between receiving motion alerts from 10 to 60 seconds. You can also set schedules for when to activate motion. So for example, you may only want to receive motion alerts between 9 and 5 when everyone is out of the house (this feature was just released and as of June 8, 2016 is only available on iOS). Video from motion alerts is written to the cloud and you’re limited to 7,200 total seconds of storage. It’s then overwritten. Might not sound like a lot but if you’re storing 5 second clips per motion event, that amounts to enough to hold 1,440 events. All video is recorded and displayed at 720p with no option to change that. Since it’s 720p, and that’s the maximum, there’s not likely much of a need to change that, so not an issue. The Blink Home Security Camera System connects to your wireless router at 2.4GHz using 802.11 b/g/n. Unlike many other home security cameras, you need to also be concerned with connectivity between the cameras and the sync module. I was able to go 50 feet between the camera and the sync module without any issues. That’s the Blink Home Security Camera System in the photo that accompanies this article. It’s sitting in my living room on top of a display cabinet. It’s quite small measuring 2.77” x 2.77” x 1.17” and weighing in at 3.3 oz (including 2 AA batteries). The cameras are very light and feel a little fragile. If you drop these on a hard surface, I’m not sure how it’s going to hold up. These are wireless cameras. No AC adapters. The two 2900 mAh AA batteries are claimed to last up to a year by Blink. That’s going to vary depending upon usage patterns and fortunately, Blink provides a battery indicator in the app. A wireless implementation has pros and cons. You can put this anywhere as long as it’s indoors and don’t need to worry about power. However, keep an eye on that battery life. I remember losing the cameras in a vacation home for an extended period because the batteries ran out. The Blink Home Security Camera System uses a Sync Module which is a small hub that all cameras communicate with. The Sync Module is a small white box measuring 2.3” x 2.45” x .70”. This part isn’t wireless and needs to plug into a power outlet. You can attach this to your home router via Ethernet cable or wireless connection. All of the Blink cameras need this to be in place for your security system to work. The video during the day is clear at 720p at 30 frames per second. The Blink cameras have a 110 degree wide angle lens. Somewhat less than many competitors so I recommend placing this in a corner to get as much of the view as possible. There is a slight lull in the video of a few seconds. There’s no typical IR night vision with these cameras. The Blink instead deploys a very bright LED light, similar to what you will find on the back of an iPhone to light up the area. This has a few disadvantages. It’s kind of annoying for those sitting in the direct view of the light and there is limited field of effectiveness. Deploying this light for extended periods is going to drain the battery. The Blink Home Security Camera System has a temperature monitor built in. Unfortunately it’s inaccurate by up to ten degrees Fahrenheit. I wrote to Blink regarding this issue. They got back to me the next day and told me this is a known problem. They had no estimated time to repair. That’s disappointing given the marketing around the inclusion of this feature. There’s an integrated microphone but no speaker. This means the Blink Home Security Camera System cannot be used for two-way communications. There is no on-board storage with the Blink camera. All events are written to the cloud. IFTTT functionality is planned as a future enhancement. A wall mount is included with the Blink Home Security Camera System. It connects to the back of the camera then screws onto the wall. Because of the small size of the Blink, some third party mounts with expandable cradles will fit this camera. The camera has a USB port. You can attach a thumb drive and write video to it versus the cloud. However that’s not available yet. It’s listed as a future plan with a tentative release date of Q3 2016. The Blink Home Security Camera System is still a work in progress. It comes at a lower price point versus other cameras in this space. Features such as video quality, night vision and especially temperature monitoring aren’t up to the level of the competitors but then again, the price is very competitive. Blink has plans to fix the bugs and introduce new features, so for those willing to wait, and also give up a little on the hardware features, the Blink Home Security Camera System might be a good candidate.